Crosby Marketing Communications has risen to #26 on O’Dwyer’s magazine’s 2019 list of Top National Public Relations Firms and stands at #7 in Top Healthcare Public Relations Firms. These annual rankings of independent PR firms, produced by one of the industry’s most-respected industry publications, are based on detailed financial information submitted by companies that is verified by their accounting firms. Crosby’s rise in the rankings followed 36.5% growth in fee income in 2018. Crosby provides integrated advertising, public relations, social media and digital marketing services through specialized practices in Healthcare, Government, Nonprofits & Causes and Military & Veterans. The firm is a top provider on the GSA Advertising and Integrated Marketing Solutions (AIMS) schedule. 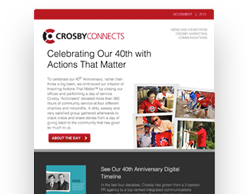 Crosby’s mission of Inspiring Actions That Matter™ helps clients make a positive impact for individuals, families, communities and society. Crosby was named a Top Workplace by The Washington Post in 2017 and 2018 for achieving outstanding employee engagement, work-life balance, pay and benefits, and company leadership.